This Quick Start automatically deploys Solace PubSub+ on the AWS Cloud. Solace PubSub+ is a message broker that lets you establish event-driven interactions between applications and microservices regardless of location. With PubSub+, you can meet all your data movement needs—publish/subscribe, queueing, request/reply, and streaming—with one platform that spans cloud and on-premises environments. You can choose from a number of open protocols, including Advanced Message Queuing Protocol (AMQP), Java Message Service (JMS), Message Queuing Telemetry Transport (MQTT), Representational State Transfer (REST), and WebSocket. 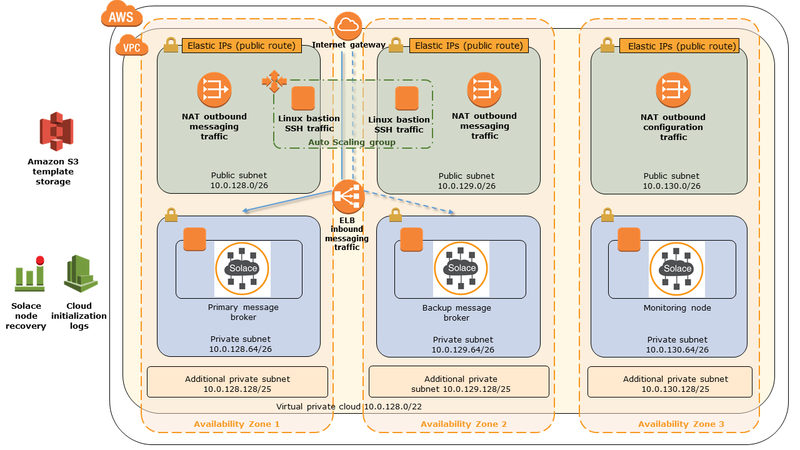 This Quick Start uses AWS CloudFormation templates to deploy Solace PubSub+ message brokers in high availability (HA) redundancy groups for fault tolerance. You can use the Quick Start to build a new virtual private cloud (VPC), or deploy Solace PubSub+ message brokers into your existing VPC. Note An earlier version of this Quick Start was published under the product name Solace Virtual Message Router (VMR). Solace has renamed their product suite, and VMR is now referred to as Solace PubSub+. See the Solace products page for more information. This Quick Start was developed by Solace Corporation in collaboration with AWS. Solace is an APN Partner. Note For production systems, we recommend using three Availability Zones, where available. For test or proof-of-concept (PoC) environments, you can choose to omit the private subnets. In each private subnet, a single message broker instance that is assigned an HA role. For auto-recovery, these instances are set up with Amazon CloudWatch alarms. Docker is installed on each message broker instance, and the message broker instance is installed and executed within a Docker container. CloudWatch logging support, including the log file /tmp/install-solace.log, which logs the events during installation. If you don't already have an AWS account, sign up at https://aws.amazon.com. See the deployment guide for resource requirements for the deployment. Obtain a reference to the Solace PubSub+ Docker image. See the deployment guide for details. Test the deployment by using the Solace Command Line Interface (CLI). To customize your deployment, you can configure infrastructure settings, boot disk capacity, and instance types for the message router and monitor instances. You can use this Quick Start to deploy PubSub+ Standard or PubSub+ Enterprise. By using the Solace PubSub+ message broker, you agree to terms and conditions outlined in the License Agreement for Solace Software on the Solace website.